Rapper Bang da Hitta was hit with drug charges Feb. 24 after police say he admitted to selling pot. 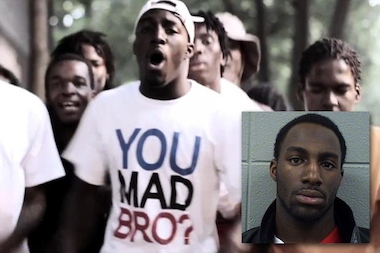 ROGERS PARK — Keith Hayer, aka rapper Bang da Hitta — who became well-known in the neighborhood for starring in a series of violent and provocative music videos — has been hit with drug charges after police said he was selling pot near Loyola Park. Hayer, 22, was arrested at 6:50 p.m. Feb. 24 in the 7000 block of North Sheridan Road after officers saw him toss to the ground a clear plastic bag of marijuana, said Jose Estrada, a police spokesman. "After he was placed in custody, he told our officers he was 'just selling some weed to make some money,' " Estrada said. "In light of his admission, he was charged with one felony count" of distributing marijuana within 1,000 feet of a school or park. Hayer's notoriety has grown in recent months after he and others appeared to flaunt an arsenal of firearms in his videos published to YouTube — while calling for the death of rival gang members, including the "L'z." "L'z" is a nickname for a Howard Street gang called LOCs, or Loyalty Over Cash. Hayer has admitted to being a part of a rival gang called the ICGs, or Insane Cutthroat Gangsters, authorities say. Hayer's bond was set at $90,000. Cook County Sheriff Spokeswoman Castalia Serna said Tuesday that Hayer was still in custody. About a day before his arrest, Hayer appeared to post to his Facebook page "Free #El Chapo," apparently referring to the arrested Sinaloa drug cartel leader Joaquin Guzman, who authorities say supplied Chicago's street gangs with drugs, including marijuana. After Hayer was taken into custody, his friends took to his page to lament the arrest of Bang da Hitta. "Free my bro Bang Hitta," wrote one person. "Free Bang Da Hitta Man!" wrote another. In similar fashion, Hayer had called in October for the release of his friends, who police say were busted after flaunting guns in his music videos. Hayer could not be reached for comment Tuesday. The rapper has been locked up before, according to court records. In 2010, he was charged with attempted murder and aggravated battery with a firearm, court records show. He acknowledged to DNAinfo Chicago that he was arrested in connection to a Howard Street shooting. His arrest report states there was one victim, Reno Foreman. The rapper had said he was "framed" and "didn't shoot anybody" and blamed corrupt police for keeping him locked up. Hayer's next court date is scheduled for 9 a.m. March 19 at Cook County Circuit Court, Branch 42, 2452 W. Belmont Ave.